June is a very, very busy month for Float. Many members of our team will be on the road this month starting with mLearnCon in San Jose June 18-21 before heading to Chicago for Techweek June 22-26 and our Float Mobile Learning Symposium on June 25 (which is a Techweek partner event – check out our page or keep reading for details on the special offers we have in conjunction with TechWeek). At both mLearnCon and Techweek, please be sure to drop by our booth. We want to talk mobile with you, as well as show you some of the things we’ve been working on so far this year. As you are likely aware, Float has always worked to help people understand and leverage the power of mobile learning. Through a variety of mechanisms including our monthly newsletters, webinars and our regular blog postings, we have shared our expertise at no charge. With that guiding force as a backdrop, Float has been working with Techweek to bring the Float Mobile Learning Symposium to as wide an audience as possible. We are pleased to announce that, working in conjunction with Techweek, Float will now be able to offer the Symposium, previously a $99 value, at no charge to attendees. Additionally, our partnership with Techweek yields yet another benefit: discounts for you! Register for the Float Mobile Learning Symposium and receive a code for a free Techweek Expo pass, as well as another code redeemable for 20 percent off the full registration price of the Techweek Conference and Expo. There are some other minor changes to our event. While we will still provide breakfast, an afternoon snack, and drinks throughout the day at the Symposium, participants will now be on their own for lunch. We encourage you to experience the other Techweek participants’ spaces and sessions just floors below, the lounges and other spaces that make this event a not-to-be-missed affair. Throughout May and into June, our speakers have been telling you about the value of their sessions and the Symposium as a whole. Problem Solutions’ chief learning officer Aaron Silvers, meanwhile, just needs to go one extra stop on the L’s brown line in order to present his session, On Designing Experiences. “Experience design applies to mobile as much as any other medium, and such design starts with a set of lenses aimed at the arc of what a designer wants to accomplish and a respect, or empathy, for the audience: the community who is part of the experience,” he says. Steven Hoober, author of Designing Mobile Interfaces, says, “responsive design is not new. Which is great, because we can use these decade-old principles instead of inventing new ones. But the way it is preached and practiced, as client-side, and all about scale, is misguided and serves no one very well.” Steven will be discussing responsive principles. 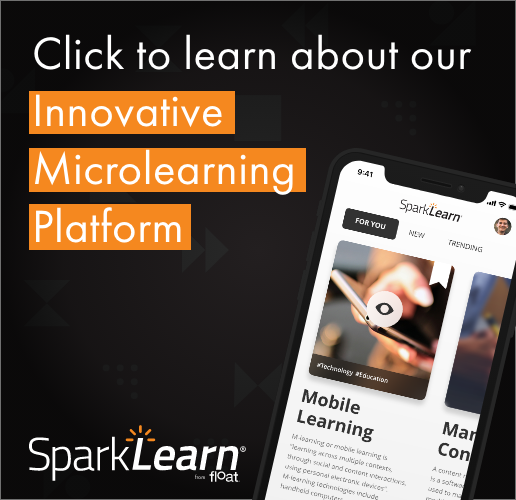 In addition to being a member of our expert line-up for the Float Mobile Learning Symposium, the self-proclaimed “mobile learning punk” Kris Rockwell will be our special guest in this month’s free webinar along with Float’s hosts Jeff Tillett, Gary Woodill and Chad Udell. During the 12 p.m. session on June 13, Float’s experts will talk to Kris about what trends he’s seeing in mobile games, gamification and serious games. After all, Kris is the founder of Hybrid Learning Systems, a company focused on mobile learning and gaming applications. Kris and Hybrid advocate that games can be more than badges and points. As mentioned in the intro, keep your eyes peeled for Float at mLearnCon. We are all set for a booth in the expo hall where we’ll be showing off for the first time what we’ve been busy cooking up over the past several months. We think you’ll like what we have to show you. Here’s a hint… It’s the first dedicated mobile app powered by Project Tin Can API, built from the ground up for social and informal learning. Did your ears perk up? Check out our site Tappestryapp.com to enter your email address and get more info when the app launches. If you haven’t finalized your schedule yet, consider joining a Float session. On Wednesday, June 20, Scott McCormick will present Winning Over Stakeholders: How to Sell mLearning to Your Enterprise. This session is geared toward project managers or other managers and executives who will be involved in implementing mobile learning. Scott will help attendees guide their organizations through the mLearning strategic process. Additionally, Float reps will be at several of the side stages throughout the conference.